When it comes to Fahaka Puffer tank mates the pickings seem to be pretty slim. The Fahaka puffer is an extremely aggressive and large species of puffer fish. 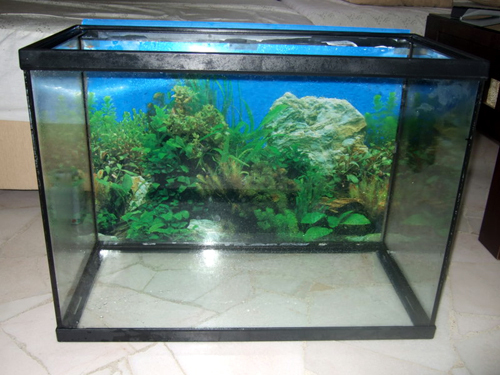 For the least amount of heart break and wasted money they should be kept as a solitary specimen in a medium-large tank, but who wants an 80 gallon aquarium with one fish in it?….right? I have been keeping Buenos Aires Tetras with my Fahaka Puffer for close to a year now and they are doing great! I have added to the colony and there are a school of 15 living with the Fahaka. The Fahaka puffer has not eaten one Buenos Aires Tetra to date. He also lives with two Julidochromis Marlieri. 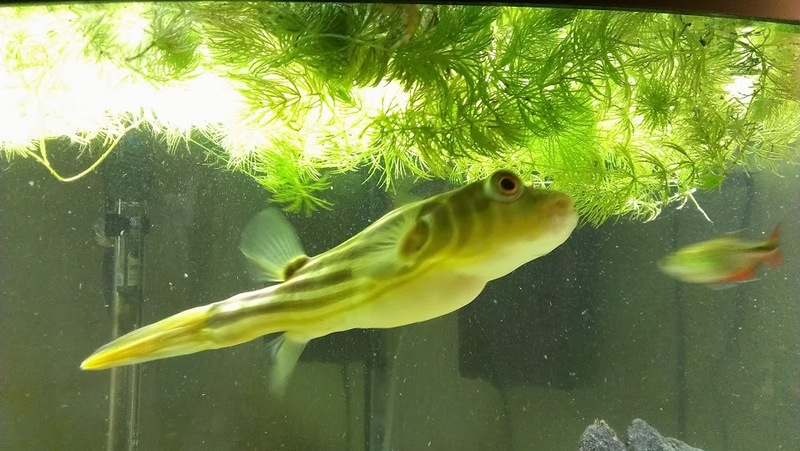 For more info on my Fahaka Puffer click here. So, I went to Petsmart on Black Friday and they had an awesome fish sale. 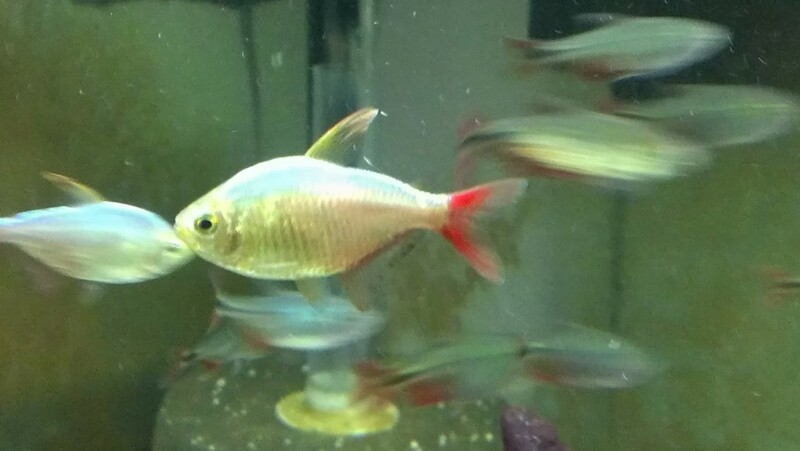 They had several species of tetra on sale for $.80… Including Columbian Tetras! (also known as red blue tetras) I couldn’t believe it. Columbian Tetras are normally $4.99 each at Petsmart and have always been one of my favorites. They are a very pretty, large species of Tetra, growing up to 3 inches. They have bright red fins and a blue shimmer across their back. the picture I posted does not do them justice, but it’s the best one I could take after several attempts. They are a robust species and are quite active. I figured Columbian Tetras are large, quick and robust, just like my Buenos Aires Tetras. They should do fine with my Fahaka! They only had 9, so I bought all 9 and brought them home. I imagined they would look great schooling along side my b.a. tetras. I wished they had more! I had never taken any precaution when adding b.a. tetras to the tank. The first few I added darted away from the Fahaka right away. After that, every time I added new fish they started schooling with the old fish and everything was fine. The Fahaka didn’t even seem to care that there were more. I thought the case would be the same with the new Columbian Tetras…. I was wrong. It was a massacre. I poured the fish in and the Fahaka started going after them. I though they would get away, but he hit one within a few seconds. I ran to the other room for the net, but by the time I got back he had already nailed 5 more. He was laying on the bottom of the tank, belly full, next to 2 dead / dying Columbians. It was too late. The Fahaka “got up” a few minutes later and starting swimming around. The 3 remaining Columbian Tetras seemed to understand the danger at this point and ran for the hills when he came near. Two days later, the three remaining Columbian Tetras are fine. They are schooling with the Buenos Aires Tetras and staying away from the Fahaka Puffer. I think they will be okay. Take away: I should have isolated the Fahaka. I think he basically “got the jump on them” when I added them to the tank. The Columbian Tetras did not seem to sense the danger as the previous Buenos Aires Tetras did. Either that, or they are a little more delicate and were in shock after being added to the new tank. I think, if I can muster up the strength to try this again, I will net the Fahaka and give the Colombian Tetras a few hours to acclimate. I feel horrible about this. I should have had the insight to take necessary precautions. I wrestled with the idea of posting this for several hours because i’m a bit embarrassed, ….but I figured other aquarists can learn from my mistake so it’s the right thing to do. Let me know what you think. Hi, I know your post was awhile back but I’m glad you posted it. I think it will definitely help others and I’m glad you didn’t let being embarrassed get in the way of posting it. All of us in the hobby have made so many mistakes and as a result so many fish have died but as long as you learn your lesson and do different next time it all works out. Only advice I wanted to give is you had said you wanted to net your puffer to take him out while you put the other fish in. Please don’t use a net with a puffer. I’m sure you probably know this by now since it’s been awhile but if he gets stressed and puffs out in the net, that will not be good lol. Anyway thanks again for having the courage to post this since I know how many people out there just love attacking others online and putting them down. Hope your puffer is still with you.